The Cairn Terrier belongs like the Scottish, Skye and West Highland White Terrier to the descendents of the old scottish hunting terriers. In contrary to his "cousins" he almost kept his lookalike and character of his scottish ancestors which were kept specially on the western highlands and on the offshore island, specially Isle of Sky, to hunt badgers, foxes and otters. At the end of the 19th century the firstly called "short hear Skye Terrier" was systematically breeded and even they are fearless and courageous they could be held in hunting mobs because they could have a terrier temperament but strictly no aggressivity against members of the same species. First at all they was breeded almost only on their performance so that no common type existed. Even as Cairn, Scottish, Skye and West Higland White Terriers was already independent breeds they were crossbred. 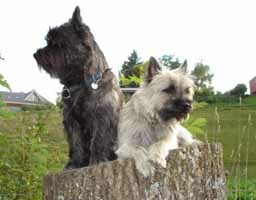 Only after the year 1924, 12 years after the recognition of the race Cairn Terrier the crossbred with West Highland White Terriern was forbidden. Even today there were Cairns born with a white mark. Due that the attribute for white is bequethed recessively Cairn breeder have to live with this problems a few more time.After heavy discussions the Skye and Cairn Terrier breeders commited 1910 to name the "short hair Skye" as Cairn Terrier.This is a really fitting name because the home of the Cairn is the stony western scottish highland and the Isle of Skye and his hair color shows the whole color palette of rocks, from blacky grey over red to sand unicolor and brindle in all shades. And finally on his originally standard his weight should be one stone / 14 english pounds.